I recently held a Giveaway on Facebook as I announced my gift certificates for Christmas. Leigh Parker was the fortunate winner of the raffle, and had just in mind what she needed! 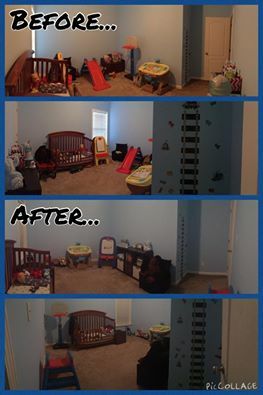 Leigh had just relocated all of her son’s toys to his room (they were previously housed in the living space). She was happy everything “fit”, but the setup was less than ideal and she needed input. Leigh lives outside of my service area, so we made a virtual appointment to get the job done. In less than one hour via Facetime, I was able to give her space planning recommendations that COMPLETELY changed the look and feel of the room. If you need help organizing or space planning, but live outside of my service area, virtual consulting is an excellent, cost-effective option. I’m thankful for the opportunity to work with Leigh, and it makes me happy to see her loving the space!